The original high-resolution images were acquired on Nov. 6, 1997, in greyscale and colorized with data acquired during a later pass by Galileo in 1998. 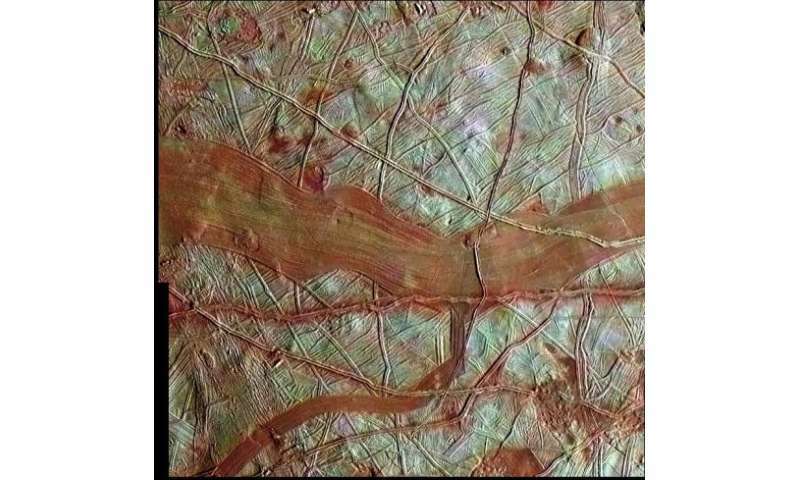 The whiter areas are regions of relatively pure water ice, while the rusty red bands are where ice has mixed with salts and organic compounds that have oozed up from deeper within Europa. The entire image area measures about 101 by 103 miles across (163 km x 167 km). Europa has long been one of the few places we know of outside our own planet where life could very well have evolved and potentially still exist. 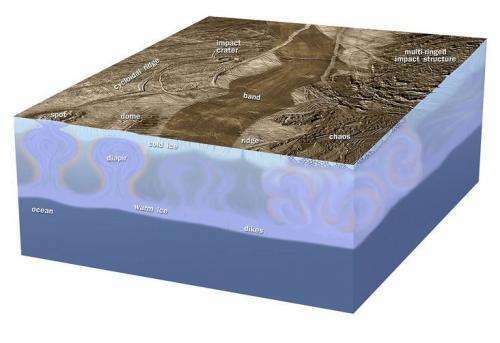 Getting a peek below the icy moon's frozen crust—or even a taste of the recently-discovered water vapor spraying from its south pole—is all we'd need to further narrow down the chances that somewhere, something could be thriving in Europa's subsurface seas. Get a planetary scientist's perspective in a video interview with Dr. Mike Brown here. Launched in October 1989, the Galileo spacecraft arrived at Jupiter in December 1995. Through primary and extended missions Galileo explored the giant planet and its family of moons until plunging into Jupiter's atmosphere on September 21, 2003.